Young and thirsty for knowledge, Chef Putri Rizky Mumpuni started her career as a struggling chef and ascended to become one of the best contestants from Top Chef Indonesia. While at that, she shared her love story with Indonesian food and her guilty pleasure. Born in the countryside of Temanggung, Central Java, the young Putri Rizky Mumpuni paved her interest in cooking from her mother and inspired by the first-ever national chef competition ever aired on TV – Allez Cuisine, a franchise of Iron Chef TV show from abroad. Since then, it was her sole wish to learn more about cookery and she migrated to Yogyakarta just to become a student of a specialized high school concentrating about food. Once graduated from high school, she was forced to choose whether the family’s fortune should be designated for her university fund or for her little sibling to continue the primary school. Sadden but still highly motivated, Putri decided to find herself a decent job so that she can save some money for college. As time went by and working in-between several odd jobs, she finally landed a job in a real kitchen. Her talent was discovered when she was working with Grand Aston Yogyakarta Hotel as she gained recognition through Salon Culinaire competition in Jakarta by winning gold and bronze medals for different categories. That’s also the time when she encountered her future boss, William Wongso. “I remembered that Pak William motivated me to cook Indonesian food and I was intrigued to really learn about it because I never had a chance to cook on something else other than Western cuisine”, said Putri. One day, she decided to join the audition of Top Chef Indonesia where she finally made it to Jakarta and finished as the top 9. “Chefs Will Meyrick and Chris Salans asked me to work at their restaurants in Bali, but I was more inclined to pursue my interest in Indonesian cuisine”, said Putri remembering the hard time on choosing what’s best for her career. Finally, she decided to contact again William Wongso to tell him about her situation and not long after that, she’s recruited as part of his food diplomacy team. Under the tutelage of William Wongso, Putri can now concentrate on Indonesian cuisine better than ever and excelled in mastering the 30 Indonesian Culinary Icons – the traditional dishes designated by Ministry of Tourism and Creative Economy last year. From here, she was sent abroad for culinary consultancy and Indonesian food diplomacy in Europe and USA. “Soon we will also head to The States again and teach in a university about Indonesian food”, admitted Putri. 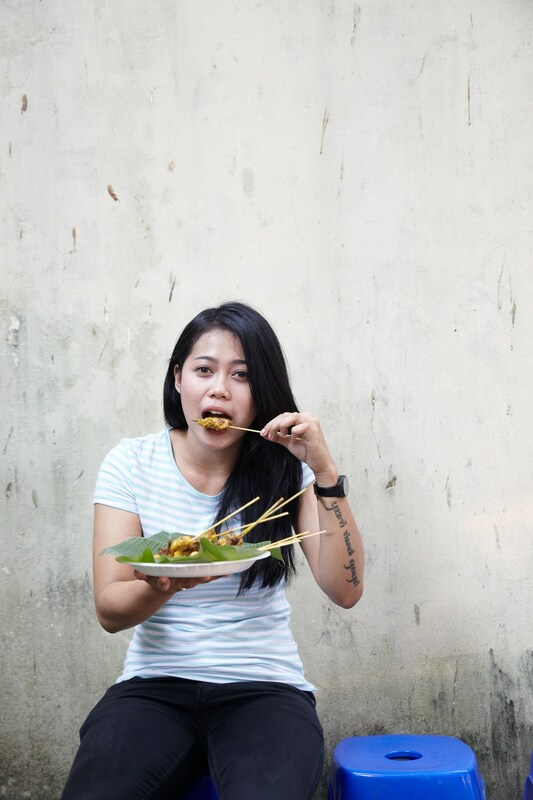 Despite her intense fascination with Indonesian dishes, Putri was initially reluctant with certain dishes, especially with sate Padang. “It was actually awkward to see the presentation of sate Padang, unlike any satay dishes that I regularly know. But when I tried it, I fell in love with it all of a sudden”, she further confessed. Not just that, she even become the regular at one sate Padang joint in Blok A where she often received additional cheek satay as a bonus from the owner. “It’s the richness of Indonesian culinary world that ultimately brings me closer to it. That’s why I could never get enough of it, especially here with the sate Padang!” exclaimed the young chef.